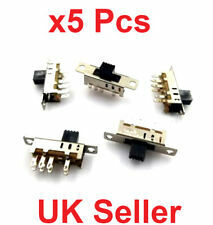 5 x Mini Miniature On/On 6 Pin Slide Switch DPDT. Brand new, high quality DPDT slide switch with solder tag connections and break before make contacts. Ideal for general purpose use. Quantity : 2 Switch Action : Slide - 3 Pos - Center Off Switch Type : DPDT Maximum Rating : 0.5A Height : 22.8mm Width : 13mm Length : 35.2mm Fixing Centers : 28mm . Dolly 4mm high. Miniature Slide Switch Double Pole 3 Throw 3 Position. 27mm to centre of mounting holes. Body of switch: 24mm long 8mm high 8mm wide. P/N SSJ22R. TYCO ELECTRONICS / AUGAT / ALCOSWITCH. ULTRA MINITURE DPDT. RIGHT-ANGLE SLIDE SWITCH. ★☆★LOT 12 PCS. Switch Actuator: 2mm (.079") H. 10.20mm (.402") L. 4.30mm x (.169") W.
5 x Miniature On/On Slide Switch DPDT. This covers things like an LED resitor calculator, all about diodes and capacitors plus much more. RoHS compliant. FAQ's, Tutorials & Projects. All our circuits are made by humans rather than assembly lines so that we can help growth by employing staff within the UK. 5 Pieces - Micro Miniature PCB Slide Switch. Current: 50mA Max. 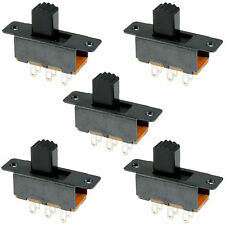 5 x Miniature 2 Position Slide Switch SPDT 3-Pin On/Off, ON/ON. 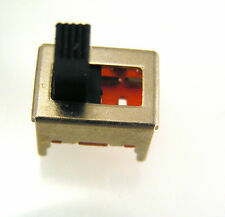 These are ultra small SPDT slide switches. Colour: Black. There is a hole for installation at each end of the switch. Size(L x W x H): Approx. Product Category: Slide Switches. Double Pole Double Throw. Travel: 6 mm. C&K Slide Switch Double Pole Changeover. Dolly: 8mm high grooved top. Body of switch (not inc. mounting lugs). Fixing hole centres 30mm. Mounting style: Panel mount via fixing holes. Length including lugs 36mm. Dolly 7mm high. PCB Mounting. Single Pole Five Throw Five Position. Miniature Slide Switch. Body of switch. 14mm wide x 4mm deep, and would sit approx 6mm up of the PCB. PCB mount, single pole three position. 4 pins to PCB. Suited to many signal switching applications. 3 x SPDT slide switches. 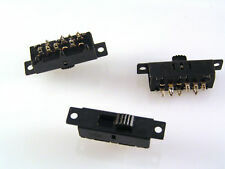 3Pcs 3 Pin 2 Position Mini Size Slide Switches On Off 5V 0.3A. There is a hole for installation at each end of the switch. Suitable for a wide range of applications. Color: Black. Canada:If your package is less than 2cm thick and less than 200gr, your shipping cost is $4. Insulation: 500MOhms " 500VDC. New by PIC. Techno Star. Fast. Simple. Type SSW2 Mini Slide Switch. Fixing lugs for mounting with 19mm centres. DPDT – Double Pole Double Throw (2 positions On-On). The actuator lever is then a further 12mm long with grooves on the top. Product Name : Slide Switch;Model : SS22F32G9;Type : DPDT;Position : 2 Features: Easy structure, mini body, 6 terminal, 2 positions, DPDT contact type, sliding knob actuator. Widely used in the electric toy, sound equipments, fax, test instrument equiopments, or other low voltage circuit electronic equipments. 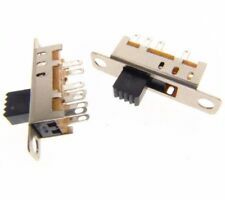 This Slide Switch features with 6 pins terminals design for easily welding onto the circuit. " Terminal Quantity : 6;Working Power : 0.5A 50V AC;Contact Resistance : 30mÎ© Max;Insulation Resistance : 100mÎ© Min at 500V DC" Withstand Voltage : AC 500V for 1 min;Installing Diameter : 2.2mm / 0.09"";Pin Pitch(Each One) : 2mm / 0.08 Switch Total Size : 22 x 6 x 21mm / 0.87"" x 0.24"" x 0.83""(L * W* H);Knob Size : 9 x 6 x 4mm / 0.35"" x 0. Mounting Type: SMD. Color: Black, White, Silver Tone. Micro Sub Miniature Slide Switch SPDT Model Railway Hobby. SPDT = Single Pole Double Throw (Double throw is another way of specifying Change Over). These mount at 90 degrees (right angle) to pcb for side action. We will hold orders until you are finished buying. Grayhill Inc. Actuator Type. Actuator Level. Slide (Standard). Height Above Board. 0.100" (2.54mm), Full. Through Hole. Mounting Type. Brand new, high quality DPDT slide switch with solder tag connections and break before make contacts. Ideal for general purpose use. 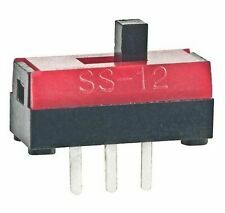 Quantity : 2 Switch Action : Slide - 2 Pos Switch Type : DPDT Maximum Rating : 0.3A Height : 14.2mm Width : 7.2mm Length : 23mm Fixing Centers : 19mm . SLIDE SWITCH SMALL SUB MINIATURE. Sanyee Miniature Slide Switch. When dolly is in centre position all connections are OFF. When dolly is to the left, single pin top far left connects to the 3 pins directly below it ON Left. When dolly is to the right, single pin bottom far right connects to the 3 pins directly above it ON Right. Pin pitch: 2.54mm. Type: 1 pole 2 throw. Colour: silver tone, black. Insulation resistance: 30Mohms (min) at 500VDC. 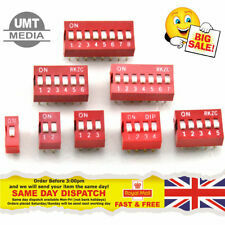 Switch total size; 8mm x 4mm x10mm. Canada:If your package is less than 2cm thick and less than 200gr, your shipping cost is $4. Add to Your Listings. 3t22p12g5. Knob height: 5mm. 4PDT ULTRA SMALL SLIDE SWITCH. MFG: TE CONNECTIVITY / ALCOSWITCH. - - - 12PC LOT - - -. 2 POS, 12 PINS ON - ON. VERTICAL MOUNTING - TOP ACTUATOR. Pin Length: 2.6mm / 0.10". SPDT = Single Pole Double Throw (Double throw is another way of specifying Change Over). 250mA @ 50v ac or dc. 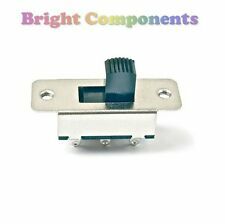 MINI SLIDE SWITCH - 3 POSITION - 3P3T - 12 PINS. PIN CENTER SPACING 2mm (0.079"). HANDLE: 0.141" (3.58mm). SIZE: 0.516" (13.11mm) L x 0.343" (8.73mm) W x 0.243" (6.18mm) H (less handle). Insulation: 500MOhms " 500VDC. New by PIC. Wk-13h09. Fast. Simple.